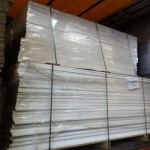 Enjoy a batch of 22 690 pallets of wood particle board for floors, walls, interior design in dry conditions. , 1593 m2, EN19 and 22 mm, following a dispute transport. ( Made in Britain ). Possibility of organizing delivery on all destination. This entry was posted in Our clearance batches, Our clearance pallets and tagged Import-Export. Bookmark the permalink.